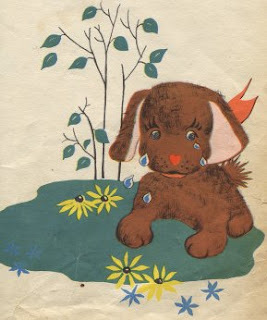 This tattered ex-library book by Alene Dalton was published by Children's Press in 1951 and illustrated charmingly by Mary Gehr. 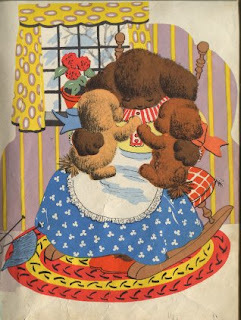 It tells the story of twin puppies, Fluffy and Bluffy and their quest for the nicest present in all the world for their mother. One day the puppies decided to surprise their mother. It wasn't her birthday. It wasn't Christmas. It wasn't even a holiday. It was just a day that Fluffy and Bluffy wanted to to find their mother the nicest present in all the world because they loved her so much. Away they went into the Enchanted Wood. By and by they heard a rustle. They heard a thump. There stood Peter Rabbit. "Well, twirl my whiskers!" exclaimed Peter Rabbit. "What are you doing in the Enchanted Wood?" "We are looking for the nicest present in all the world for our mother. Do you know what it is?" "Certainly," said Peter Rabbit. "It is golden carrots." He gave them a carrot. When Peter had disappeared back into the woods, Bluffy said, "A carrot does not seem like the nicest present in all the world." "Let's look a little further," said Fluffy. Fluffy and Bluffy soon came to a little lake. They heard a splash! 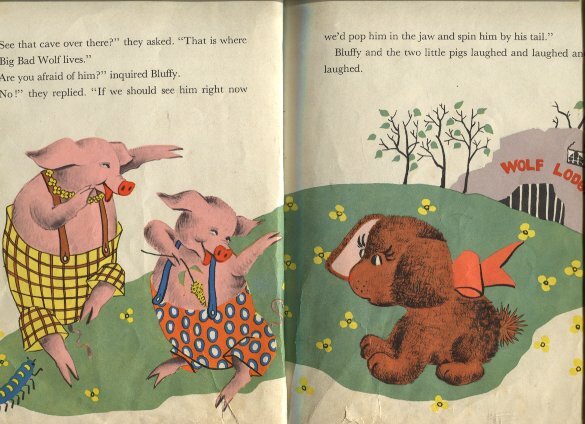 There, the Three Little Pigs were drinking noisily. "Good morning!" called Fluffy and Bluffy. "Well, straighten our curly tails," answered the Three Little Pigs. "What are you doing in the Enchanted Wood?" "Certainly, " said the good little pig. "It is wolf-proof paint." While Fluffy went with him to get a can of it, the other two pigs led Bluffy into the thickest part of the wood. They thought they were very clever. "See that cave over there?" they asked. "That is wehre the Big Bad Wolf lives." "No!" they replied. "If we should see him right now we'd pop him in the jaw and spin him by his tail." Bluffy and the two pigs laughed and laughed and laughed. Suddenly they heard a horrible growl. They whirled around! coming toward them was a great big furry beast. "EEEEEEK!" squealed the two little pigs. "It is the big bad wolf." Before Bluffy knew what had happened, the wolf had chased the two little pigs out of sight. Bluffy was left alone. He was lost. Where was Fluffy" A big tear slid down his cheek. He cried and cried. Bluffy started to run. He bumped into a giant toadstool. He heard a tinkle. He heard a little bell. He wondered what it was. A little elf with one wing slid down the toadstool and landed in front of BLuffy. "Who are you and why are you crying?" he asked. "I'm Bluffy, and I'm lost." "How did you get lost?" asked the little elf. "I didn't stay on the path," sobbed Bluffy. "I guess I am. BUt I don't mean to be." My name is Fibber-dibberus." said the elf. "They call me Fibber-dibberrus because I...tell...fibs." But I've learned my lesson. Both of my wings slowly disappeared. 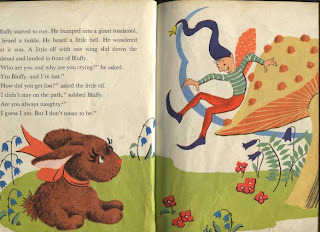 "But you have one wing," said Bluffy. "It grew a little because I was truthful and kind. I'd be glad to help you get unlost." said the elf. Fibber-dibberus rang his little bell. As if by magic, Bluffy found himself beside Fluffy. Fibber-dibberus was there, too. Bluffy turned him around to see if his second wing had started to sprout. "Oh, Fibber-dibberus! Your second wing has grown an inch!" 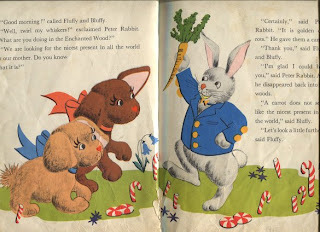 "We have a carrot and a can of wolf-proof paint," said Fluffy. "That doesn't look like the nicest present in all the world. Let's look further." said Bluffy. 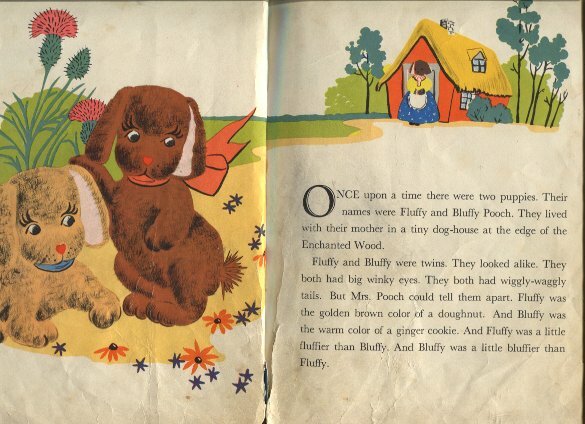 Fluffy and Bluffy soon came to a little house at the edge of the wood. They knocked on the door. Nobody answered. They knocked again. Baby Bear opened the bottom half of the door. "We are Fluffy and Bluffy, and we are looking for the nicest present in all the world for our mother. Do you know what it is?" 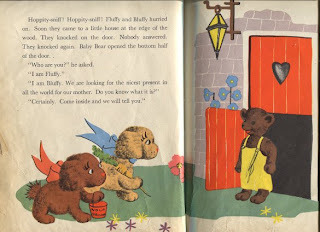 "Certainly," said Baby Bear, "Come inside and we will tell you." 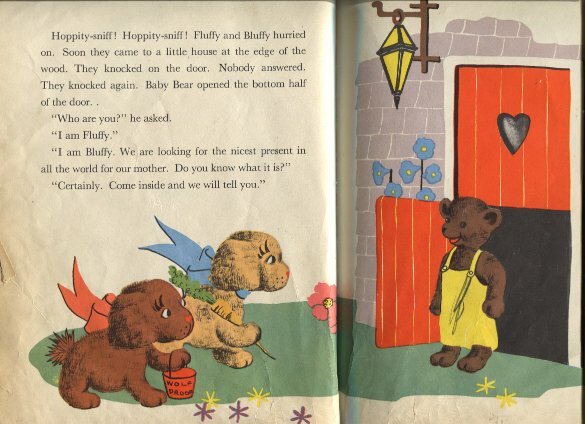 The door to the Three Bears' house opened wide. There was the middle-sized Mama Bear. And there was the Great Big Papa Bear! Fluffy and Bluffy forgot what they had come for. 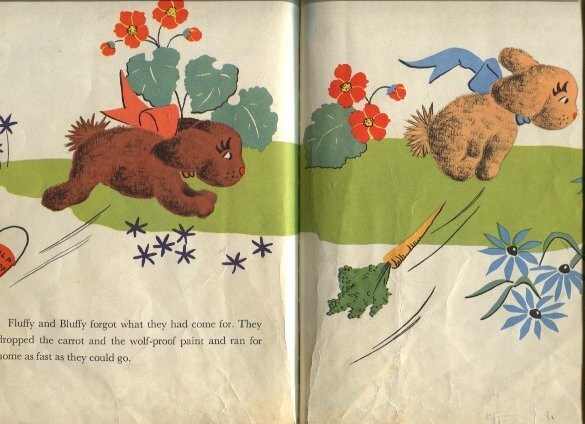 They dropped the carrot and the wolf-proof paint and ran for home as fast as they could go. They jumped into Mother's lap. They threw their arms around her neck. "What a surprise!" said Mother. "You have brought me the nicest present in all the world." Fluffy and Bluffy looked at each other. They looked under the chair. They looked under the rug. Mother laughed and laughed. "You can't see the nicest present in all the world," she said. "The nicest present is love, especially when it is wrapped up in a big bear hug." Fabulous! I've shared on Google+ and Facebook! YAY! Great post! Nice Interesting blog you have shred here thank you so much for sharing such article at this platform. This is such a cute post and I really enjoyed reading the poems. It made me really happy. Thank you for sharing this article on this platform. Stay blessed.